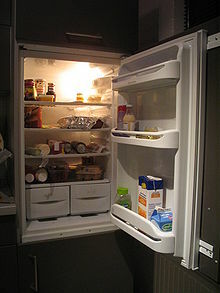 A household appliance used for keeping food fresh by refrigeration (short form fridge). One who has a chilling influence. […] in a state of sublime satisfaction, he moves among the company, a magnificent refrigerator.